You'll save 10% on your first order and a further 5% on every James Wellbeloved product, in all subsequent orders. 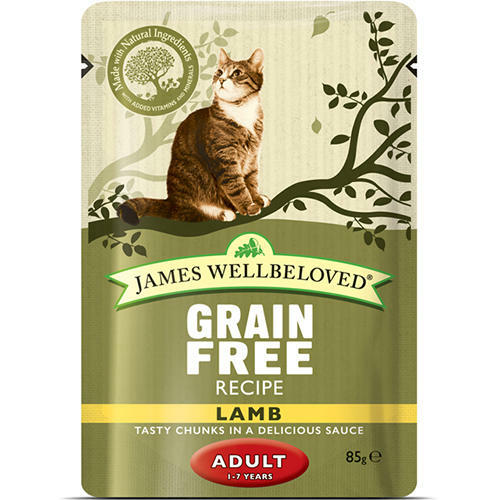 With selected protein source (lamb) and selected carbohydrate sources (potato and cassava) James Wellbeloved is a fantastic dietetic food, excellent for the reduction of ingredient and nutrient intolerances. The extra ingredients may sound a little odd to be giving to your cat, but this recipe is a complete wet food with the bonus that it is hypo-allergenic. With cranberry, chicory, yucca and tomato extracts. We suggest that the food be tried for a period of 3 to 8 weeks. If it works well and the signs of food intolerence disappear, continue feeding it to your cat indefinitely.